Jessie wants to live in a world where health equity is achieved through collaboration and cultural diversity. She’s worked in various capacities for the Yellowknives Dene Community Wellness department, the territorial government, and volunteered at the Culturally Relevant Urban Wellness Program at the Institute for Aboriginal Health in Vancouver, BC during her undergrad. She is the current youth representative for the Native Women’s Association of the Northwest Territories where she helps to coordinate and create services from the ground up that will empower the most vulnerable members of society. 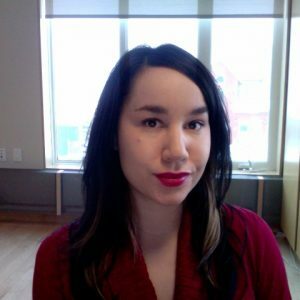 Jessie is involved in a community-based research project on climate change adaptation in partnership with Kalemi Dene School in Ndilo. She enjoys watching the student researchers explore Indigenous research methodologies and build a deeper understanding of their vital role in climate change adaptation and mitigation in the Northwest Territories. When not working at ICHR, you can find Jessie hiking or camping in beautiful Denendeh. Jessie is the past research coordinator for the Climate Change & Our Lands in Film research project. In addition to this internship, Jessie is currently working as the Executive Assistant to Chief Ernest Betsina of the Yellowknives Dene First Nation.